A: Yes, all over northern California but, once again please be aware that due to rising gas prices and the possible need for an extra truck, larger trailers and labor that travel fees can be quite high. Please call our office for a current quote. A: No. We arrive 1-3 hours early to set up so you get the entire rental time to play. A: That depends on how many rentals we have that day. Generally we arrive 1-3 hours before the rental time begins. A: Yes. A blower keeps air in the jump unit the entire time. Once unplugged they deflate. That's why we require an outlet within 50ft of the unit or a generator. Longer cords can pop your circuit breaker so we bring our own heavy duty cords. A: Cash or checks. If paying by cash, please have exact change as our crew does not carry cash. A: Please check out your contract page for details. A: Yes all orders require a 50% deposit. They are non refundable but you will be given a credit that is good for 2 years. A: We can set up on Grass (our favorite and best for the kids), asphalt, and concrete. Sorry, we can't set up on any type of dirt, gravel or rocks as the constant rubbing will wear through the vinyl . RULE # 1 and MOST IMPORTANT: A Responsible Adult Must Be in Attendance and Closely Supervise All Activity While Any Inflatable or Piece of Our equipment is In Operation. You, the customer are responsible for providing such supervision during the entire time that our party rental equipment is in your possession, unless Prime Time has agreed in writing to provide this service. 2.) Do not overload any inflatable. 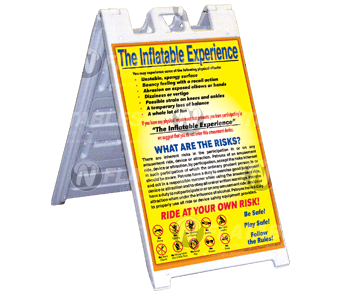 Each of our inflatables has a capacity chart posted on the inflatable near the entrance. The maximum rider capacity should never be exceeded. 3.) Do not use the inflatable during periods of rain or excessive winds (20mph or greater). In the event of severe weather, (lightning, thunder, rain or high winds) instruct all occupants to immediately exit the inflatable and DO NOT allow re-entry until the weather clears and inflatable is DRY. 4.) All Inflatables are physically challenging. Any person with a health impairment, disease, high blood pressure, back, neck or other bone/joint problems, or any other conditions that might cause problems when physically challenged should not be allowed in any of our inflatables. 5.) Remove shoes, necklaces, eyeglasses, jewelry and other hard or sharp objects prior to entering any inflatable. 6.) All participants should empty their pockets before entering the inflatable. 7.) No hot objects are allowed in or near any inflatable. 8.) No Gum, No Face Paint, No Candy, Food or Drinks are allowed inside any inflatable. 9.) No Silly String shall be allowed inside or in a close proximity outside where it may come in contact with our inflatable. If Silly String comes into contact with any part of our inflatable damage charges may be assessed. 10.) Absolutely NO flips, wrestling, or other forms of rough housing are allowed in the inflatable. 11.) Participants in a bouncer and generally all inflatables should be grouped according to age and size. 12.) Participants should not sit or lay down while others are bouncing around them, as a jumping child could fall down on top of a sitting or lying child. 13.) No jumping down any slide surface. Participants must come down any slide surface one at a time feet first. 14.) Do not run or jump through the door into or out of the inflatable. 15.) Do not jump on the entry step of any inflatable. 16.) Do not climb on the exterior of the inflatable. 17.) Do not attempt to climb on the window mesh/screening of any inflatable. 18.) If anchors come loose or should the inflatable begin to deflate during operation, immediately and calmly instruct all participants to exit the inflatable and call the delivery crews emergency cell phone # or our office # for assistance. If at any time during your rental, you are unable to provide the proper adult supervision that our equipment includes we recommend that you stop using and turn off the equipment until such time that proper supervision is again present.